Now we know. A disorderly Brexit could be worse than anyone had ever imagined, costing 80,000 jobs and resulting in a €100bn hit to the economy over 10 years. The most stark aspect of new research from the ESRI is that the economic damage caused by a managed no deal or a chaotic no deal is almost identical – GDP reduced by 4.8pc or 5pc over the next decade. Clearly, any form of no deal has to be averted at all costs. But, the Government in this country has no power to stop it. We are at the mercy of the British, who appear more interested in petty squabbling than avoiding imminent disaster. In effect, the British have strapped a bomb to this country and are now, as the timer rapidly approaches zero, in the process of deciding whether they are going to defuse it before it goes off. Ireland isn’t the only European country that is going to be impacted if the British decide to detonate their explosive device. Also caught in the blast wave will be the Netherlands, where the cost of a no-deal exit has been placed at €34bn, and Germany, where it has been estimated that up to 100,000 jobs could be lost. One study has put the global impact of a no-deal scenario at an incredible 612,000 people worldwide losing their jobs, with the effects being felt as far away as China where 60,000 jobs could disappear. More than 600,000 jobs lost – all because the British wanted to have blue passports and don’t like brown immigrants. Just when you think British politics has reached its nadir, it manages to sink even further into the mire. Debates in the House of Commons are now more reminiscent of mud-wrestling competitions than oratorical endeavours. No one even blinked an eye on Monday when one Tory MP, Nicholas Soames, felt the need to clarify he “still believe[d] in sanity”. Theresa May’s harried demeanour and desperate pleas to parliament make her look more like a hostage victim than prime minister, held captive by the hard Brexit wing of her warring party and forced to issue regular demeaning statements to try to placate them. Once thought of as a safe pair of hands, Mrs May can now only be counted on for one thing – an uncanny ability to make a bad situation even worse. And, under her tenure, the situation is deteriorating every single day. The British public, aghast at what is going on, have lost all confidence in their politicians – 90pc of them now believe the government’s handling of Brexit negotiations is a national humiliation. Yesterday, we learned Jacob Rees-Mogg, who previously described May’s deal as turning the UK from “a vassal state to a slave state”, is now considering voting for the deal after all. Meanwhile, Boris Johnson has implored the prime minister to “channel the spirit of Moses in Exodus and say to the Pharaoh in Brussels, let my people go” – evidently forgetting the Israelites then spent 40 years in the wilderness. Two days before the original March 29 deadline, and a little over two weeks before the revised April 12 cut-off, parliament will only today hold a series of indicative votes to try to discover what form of Brexit members can support, if any. According to one British newspaper, if the prime minister doesn’t allow a free vote on those options, she faces up to 30 resignations from her government – on top of the three ministers she lost on Monday. The dereliction of duty by British politicians, who have put the fate of their country at such unnecessary peril and endangered the economies of its allies around the continent, is unprecedented in modern times. The DUP, which has acted with such rigid fanaticism and fatuous bluster, deserves particular opprobrium. If the UK crashes out of the EU, the names of their 10 MPs will go down in ignominy. Appeals to reason and rationality simply don’t work when it comes to the DUP. Earlier this month, the head of the civil service in the region, David Sterling, warned of “grave consequences from a no-deal Brexit”, including a “sharp increase in unemployment”, food shortages and civil unrest. In response, DUP MP Sammy Wilson accused Mr Sterling of “scare tactics” and said he “didn’t care if [Mr Sterling] was the head of the civil service or Santa Claus”, he was wrong. Mr Wilson enjoys engaging in personal insults, but his talents end there. Mr Sterling was merely echoing forecasts that have been widely available for some time, with Northern Ireland set to fare worse than any other area of the UK if there is no deal. A previous study has estimated Northern Ireland’s economy will shrink by 10pc over 15 years in the event of no deal while, speaking in the House of Commons on Monday, the prime minister admitted the region has been unable to plan for a no deal because there is no devolved government in place to do so. While the DUP can’t be swayed by objective economic analysis, it also won’t yield in the face of concerns from its own constituents. 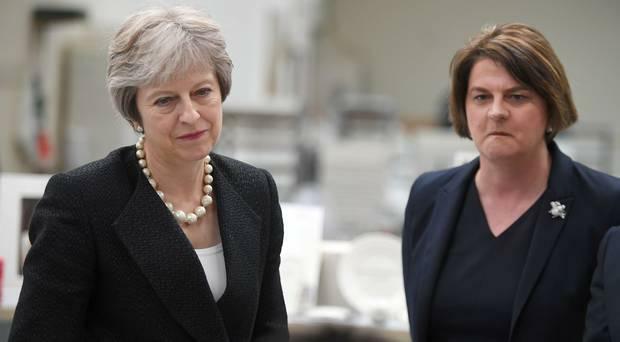 A recent opinion poll in the ‘Irish Times’ found 67pc of all voters in Northern Ireland believe the DUP is doing a bad job of representing the area, while 69pc of voters, including 57pc of those with a Protestant background, are dissatisfied with party leader Arlene Foster. The same poll found 59pc of the population would be perfectly happy to see a border in the Irish Sea rather than a hard border on this island – a prospect the DUP has refused to countenance, leading to the current impasse over the backstop. Economically illiterate, the DUP is also ignorant of history. A border in the Irish Sea is not an unprecedented phenomenon. A de facto border existed throughout World War II when travel between Northern Ireland and Britain required a permit, with immigration checks lasting until 1952. For our own Government, trying to negotiate with a lame-duck leader propped up by a cabal of maniacal extremists, the situation couldn’t be worse. Given the British propensity for chaos, negotiations with the EU about financial supports to protect Irish businesses from a no-deal calamity need to finalised and made public.